October is quickly coming to a close and Halloween will be here next week! I made some pumpkin bread the other day and I saved the cans. 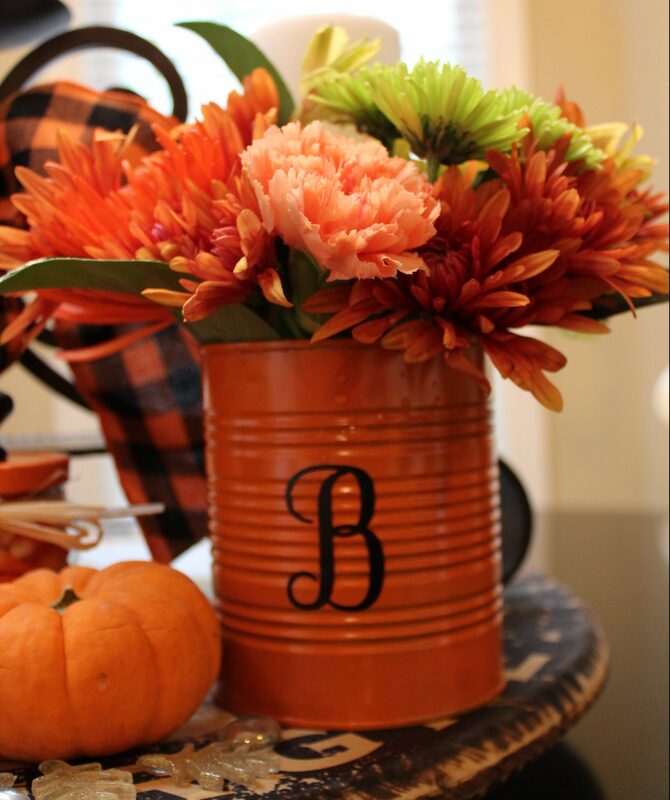 Why not whip up a few crafts with the pumpkin cans? I try to recycle as much as possible. When I don’t save cans and jars I toss them in the recycle bin. This time I decided to save a few of the cans. The labels come off easily with the help of Goo Gone. (I don’t know what I would do without this stuff! Stores insist on putting sticky labels on everything!) And any size can will do! Once the cans were clean and dry I painted them with a few quick coats of Rustoleum Orange Gloss. This can of paint has gone a LONG way! I added some cursive letter “B” stickers on the front of the cans and filled them with store bought flowers and some water. The beauty of cans is they hold water without leaking. You can even glue some felt on the bottom to prevent scratches on your furniture. A few of these scattered on the tables at Thanksgiving will look pretty and festive. After dinner, guests can take them home! The last name of both of our families start with B so we’re good! Our neighborhood does “BOO” bags every year. It’s starts when someone picks two houses at random and puts a container or bag full of candy along with instructions to pick two other homes and repeat the process. Once your house has been “booed” you tape a white paper ghost in your front window to ensure you don’t get booed twice. When Halloween finally comes, everyone has taken part! This just goes to show that paint and flowers can make anything more attractive! Happy Halloween!